The conversation surrounding student loans is typically pretty negative – and for good reason. Loan rates are rising, and student loan debt is an epidemic affecting millions of Americans. But did you know that student loans can be a good thing? While frustrating to pay back, student loans are also a great way to build a solid foundation of credit for young people. Establishing a firm credit history will set you on the path to smooth sailing in your adult years. Ignoring your credit will lead to financial anxiety, limit your opportunities and set you up for a rude awakening. Remember earlier this week where we shared the story about the guy who couldn’t get a mortgage for his house because he went his whole life using his debit card? Well, if you pay back your student loans responsibly, you won’t be that guy. When you take out a loan or line of credit, it’s reported to some or all of the three major credit bureaus (Experian, Equifax and TransUnion). How you treat that loan affects your credit score depending on if you make timely payments, if you stay current on your loans and how old your debt is. When you make payments on a student loan, you show potential lenders that you’re responsible. They use your credit report and score to gauge whether or not you should be lent more money in the future. For example, paying back your student loans can help you be eligible for a credit card or mortgage later in life. And if you build great credit, you’ll typically qualify for the lowest interest rates and best promos. Unfortunately, the reverse is also true. If you’re late on several payments or default on your loans, your credit will tank and it will be hard or impossible to get approved for new forms of credit. You can view your credit reports for free at annualcreditreport.com. This website allows you to access your credit reports once a year for free. Checking them regularly can help you spot inaccuracies, which should be found and reported as soon as possible. Negative marks can drag down your credit score quickly. You can also check your credit score for free here. 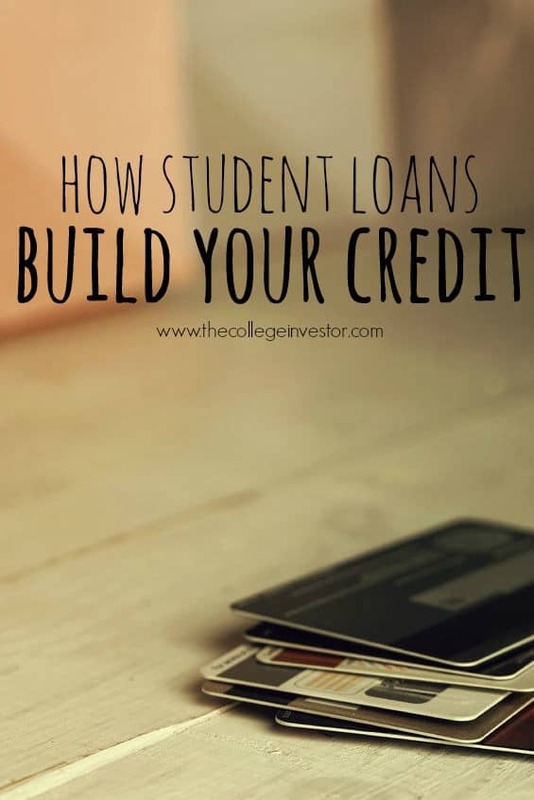 Building good credit through your student loans is as simple as making your payments on time. Every month. Without fail. Seriously. While this sounds extremely simple – and it is – it’s also commonly ignored advice. People get lazy, lose track of due dates and let the hectic nature of student and post-graduate life cloud their judgement. Another big potential pitfall has to do with income-based repayment plans. With income-based repayment plans like IBR, PAYE, and RePAYE, you have to re-certify your income every year to keep your low student loan payment. If you don’t send in the paperwork and re-certify, your student loan payment will jump up a lot and you could be faced with a challenge. So don’t let that happen to you, and continue building good credit. You can also set up auto-pay through your lender so you never miss a payment (sometimes this also results in a slight interest decrease). Calendar reminders can also help you keep track of your payment due date, especially if you have multiple loans through different providers. Apps like Mint may also remind you of your due date several days before it’s time to pay the bill. Some people think they don’t need to worry about credit if they don’t plan to borrow more after they’ve paid off their student loans. Unfortunately, everyone from your future employer to your landlord will check your credit. Companies check prospective employees’ credit reports to see if they’ve been responsible with money. This is even more vital if you’re applying for a job where you’ll be handling company funds. Those in a position to receive bribes may also get denied if they have bad credit, since they’re seen as being more susceptible to shady financial decisions. Realize that your credit score could even get you fired. If you’re renting an apartment, your landlord will likely check your credit report. Again, credit reports are a good gauge of how likely you are to pay your bills – including rent and utilities. Even if you don’t plan to buy a home or use credit cards, you’ll most likely run into a situation where good credit is mandatory. Have you been staying on top of your credit score? 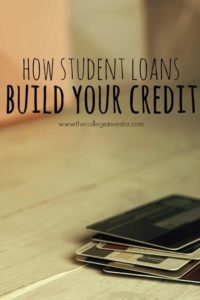 Thanks for the awesome advice about building credit through student loans. I never thought about the positive aspect of building credit card. Thanks for sharing!!! Great to see a post pointing out something good about student loan debt. I’m currently still working to pay mine off and knowing I can come out of it with something good is a big motivator.